The government investigates the mass murder of Ku Klux Klan members which seems to have been carried out by a previously unknown group. An operative named Jake Farrell is sent to the scene where the local authorities comment that all of the burning bodies have been treated with a chemical that removes any smell, presumably so they did not have to suffer the smell of burnt flesh. Jake recognizes the emblem on the calling card left behind by those responsible and departs. Deep within a sub-basement below the Pentagon, a group of scientists are visited by Shaft who is concerned over their current project. Since Youngblood delivered the brain-washed SuperPatriot into the government’s custody he has been experimented upon by these men. The veteran superhero is unveiled to Shaft who is informed that they cannot release SuperPatriot until they are satisfied that he no longer poses a threat but they are up against a major problem. Jake delivers a briefing to several government officials about those responsible for the massacre, a group he has identified as the Covenant of the Sword. This terrorist organization had been thought of as strictly small-scale but they are now boosting their profile with their very public display. He suggests that as the gauntlet has been thrown down at them that they must respond in kind with some kind of a retaliatory strike against the Covenant. 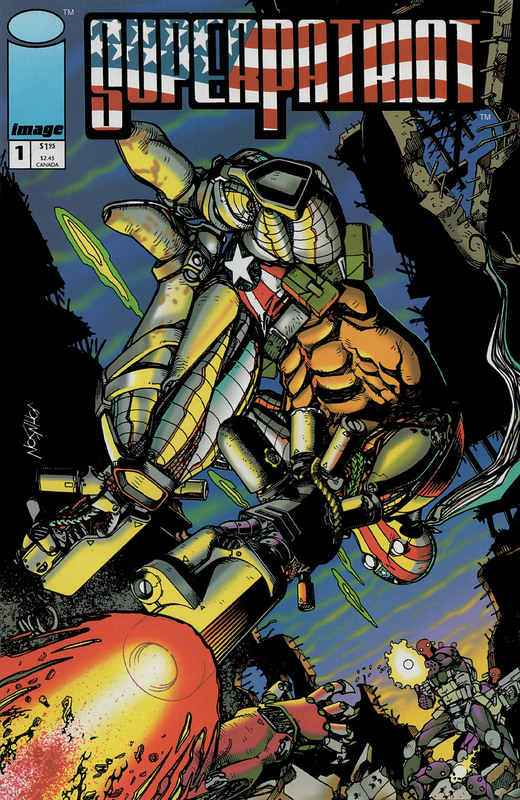 SuperPatriot is locked in battle against numerous armored soldiers whom he slaughters with relative ease but things start to go wrong when a superhuman opponent is introduced. His mind can only visualize such foes as Dragon, a condition that begun after he first clashed with the super-powered police officer. This battle had all been a virtual reality test run and Shaft is informed of this weakness, something that gets him killed in every single scenario that they have employed so far. The Covenant is informed by a double agent that the government is preparing a strike against them but they are already full prepared. They have allowed the location of a relatively minor installation to be leaked out, sacrificing this base for a greater prize. The Covenant’s ruling body called the Council look forward to proving just how formidable they are and how vast their resources are.